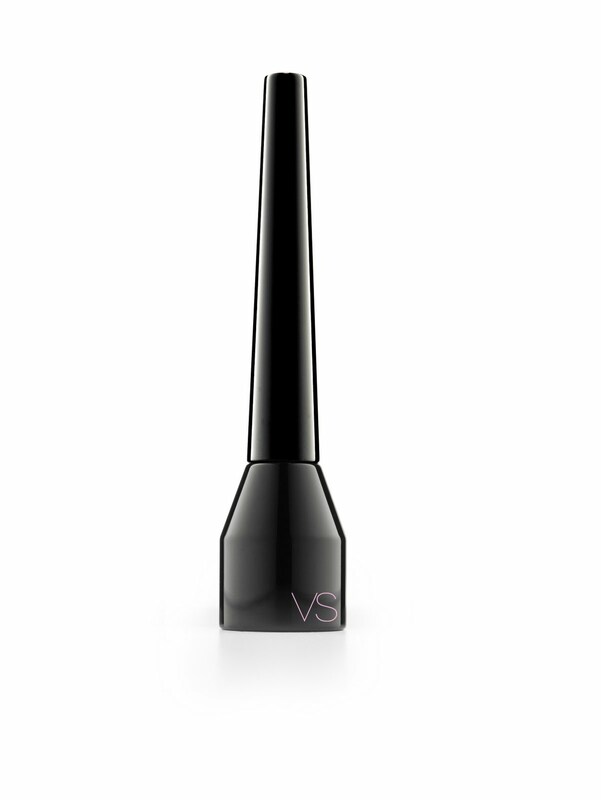 With a touch of Victoria’s Secret Makeup Hypergloss Eye Shimmer ($12) eyes will sparkle like jewels. Next, VS Makeup Brilliant Glitter Liquid Liner ($10) adds a bold line of glitter and sparkle to lids. Bat those festive faux lashes honey! Ardell Elegant & Wild Lashes are strip lashes adorned with rhinestones and glitter. M.A.C. 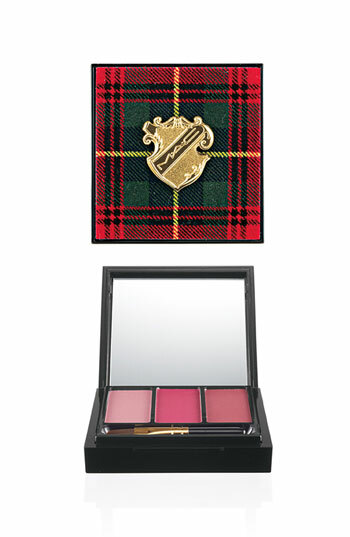 Happily Ever After Lip Kit ($22.50) has the perfect party shades—Cheers All Round, To Joy, and Endless Fun, in a tartan compact with the M.A.C. crest. 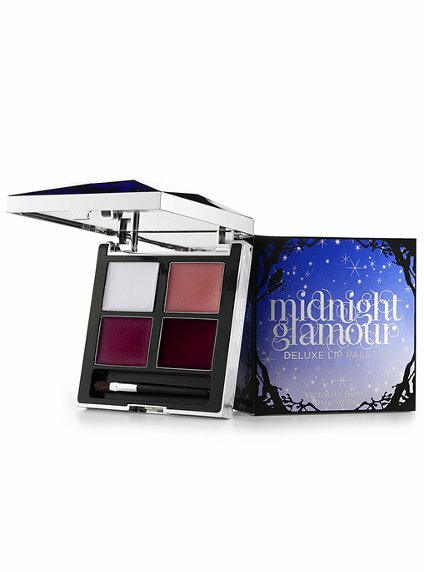 Victoria’s Secret Holiday Limited Edition Midnight Glamour Deluxe Lip Palette ($16) has shimmering glosses to prepare lips for that special midnight kiss. 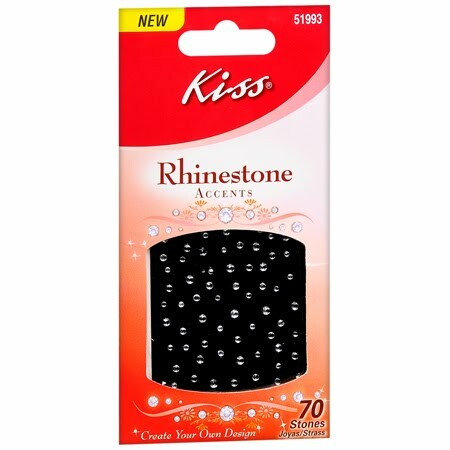 Dress up your favorite party lacquer with Kiss Paint & Stencil Kit ($2.99) in Silver or Gold. 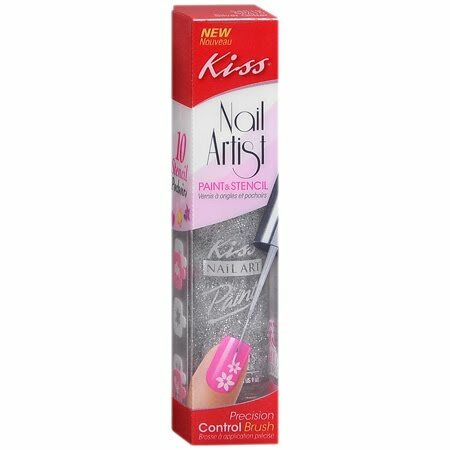 The kit comes with nail art paint, stencil designs and control brush. Or create your own nail designs with Kiss Rhinestone Accents ($3.49). 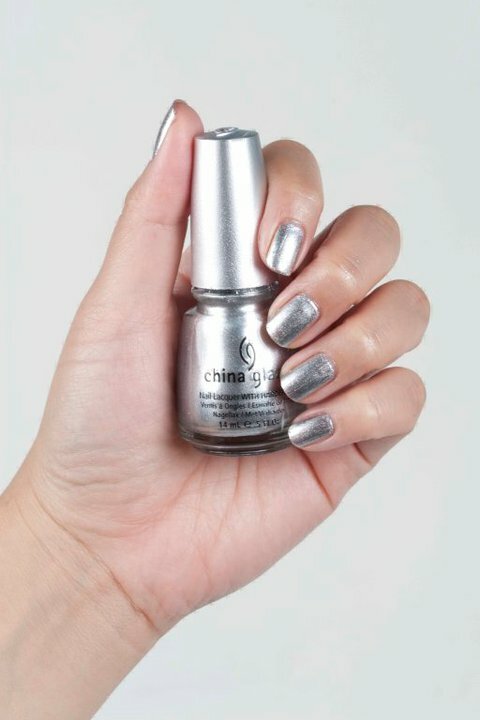 China Glaze’s Cheers To You ($13) is a duo nail polish kit containing Midnight Kiss (a dreamy, creamy gold) and Cheers To You (a bold and glitzy silver). 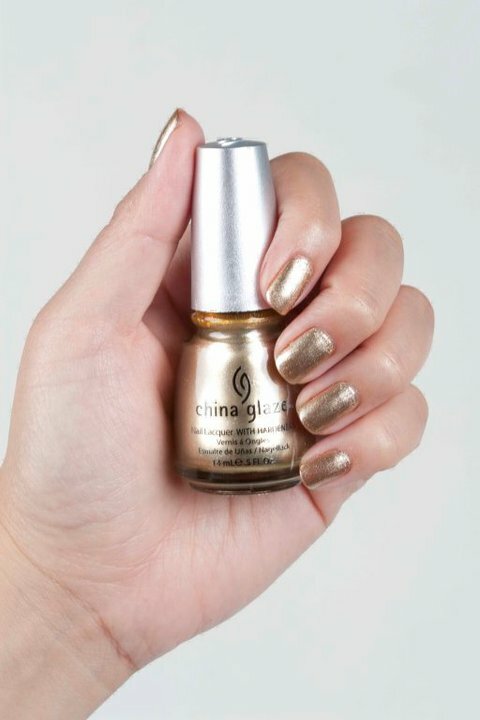 The set comes with a China Glaze shot glass to help you toast in the New Year. 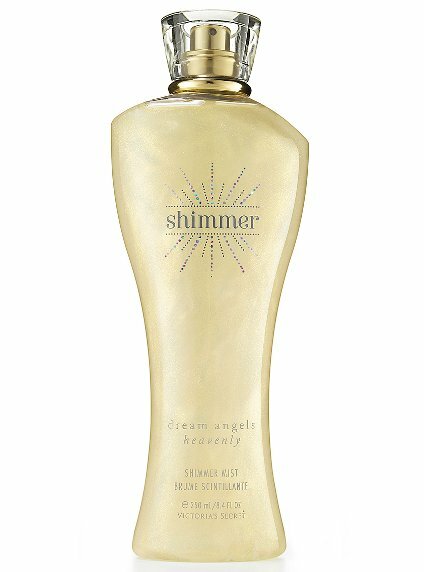 Dream Angels Heavenly Holiday Limited Edition Shimmer Mist ($25) from Victoria’s Secret, adds a luminous, golden glow to shoulders, legs and décolleté with the sensuous fragrance blend of white musk, sandalwood, vanilla and white peony. 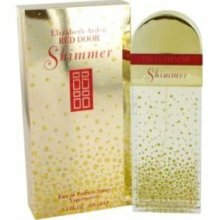 Elizabeth Arden Red Door Shimmer Eau de Parfum Spray ($45) and Shimmer Body Lotion ($29.50) scent the body with a hint of shimmer. Pumpkins are used for more than just jack-o’-lanterns and pies (although a warm slice of the latter with vanilla ice cream would really be a treat about now.) Pumpkin is also a treat for the skin. Pumpkin contains natural enzymes that gently exfoliate the skin and stimulate production of new cells, which is why it is often an ingredient in masks and scrubs. Pumpkin seed oil is rich in polyunsaturated fatty acids and nourishes the skin. There are two products from Crater Lake that contain pumpkin among the ingredients. Pumpkin & Oats Nourishing Face Masque ($17, 1 oz) contains pumpkin to rid of the face of dead skin cells, as well as colloidal oatmeal and organic marshmallow root powder to help soothe inflammation, and Egyptian frankincense powder to improve skin tone. The all-natural dry powder masque is used with a liquid activator customized according to skin type. The Warm Pumpkin Bread Body Scrub ($19.95, 9 oz) features protective pumpkin oil as well as pure white cane sugar and pumpkin flakes to buff away dead skin cells, revealing more radiant skin. For more information visit www.craterlakecompany.com. Farmhouse Fresh Splendid Dirt Delectable Mud Mask ($20, 3 oz glass jar) is especially great for problem skin that suffers from acne, blotches, redness and excessive oil. This warming mask contains two types of clays (bentonite and illite) that have healing properties and also helps deep clean, detoxify and unclog the skin. Yogurt cultures contain lactic acid, an alpha-hydroxy acid that stimulates circulation for more healthy-looking skin. 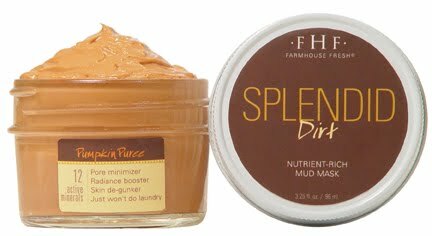 The Splendid Dirt mud mask is available at www.farmhousefreshgoods.com and fine boutiques, resorts and spas. 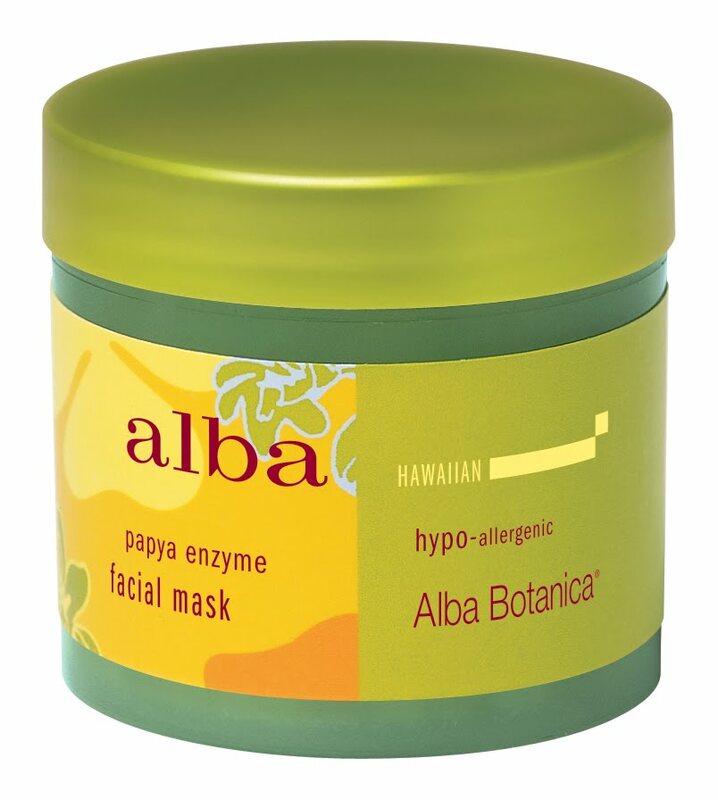 The pineapple enzymes and pumpkin seed extract in Alba Botanica’s Hawaiian Papaya Enzyme Facial Mask ($12.95, 3 oz) naturally exfoliate to lift dead skin cells, while papaya enzymes loosen and dissolve dead cells and impurities, increasing circulation and revealing a brighter complexion. Visit www.albabotanica.com to find a store near you. 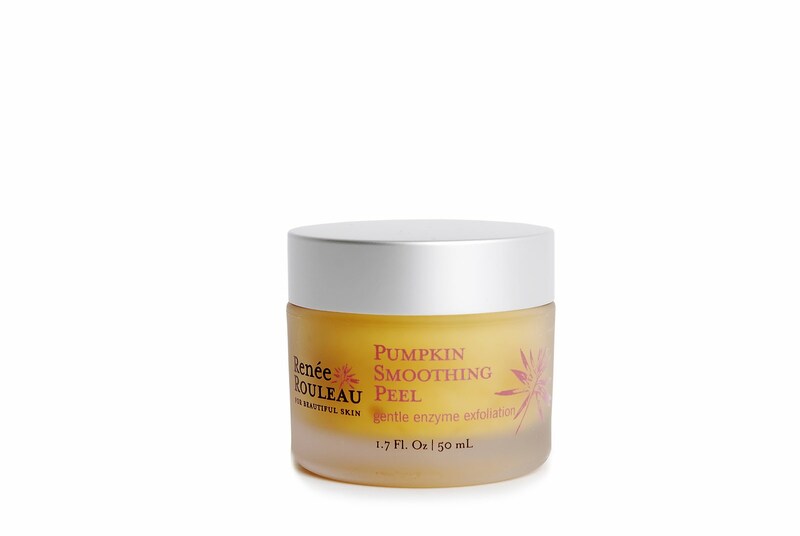 Renee Rouleau’s Pumpkin Soothing Peel was formulated with super-sensitive skin in mind. Mild corn meal grains gently exfoliate, with green tea extract, carrot tissue extract and antioxidants rounding out the soothing ingredient blend. The Pumpkin Soothing Peel is $51.50 (1.7 oz) at www.ReneeRouleau.com. Whole Truth Holistic Health Solutions’ Healthy Beauty Bath Bars are handmade with 100% plant-based and vegan ingredients, including natural teas, organic oils and butters, and healing herbs. 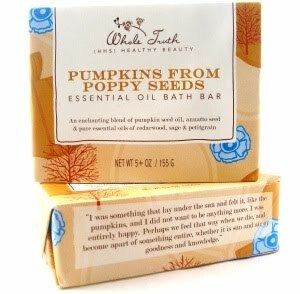 The Pumpkins From Poppy Seeds essential oil bath bar ($7, 5 oz bar) is great for acne sufferers and people with oily skin. 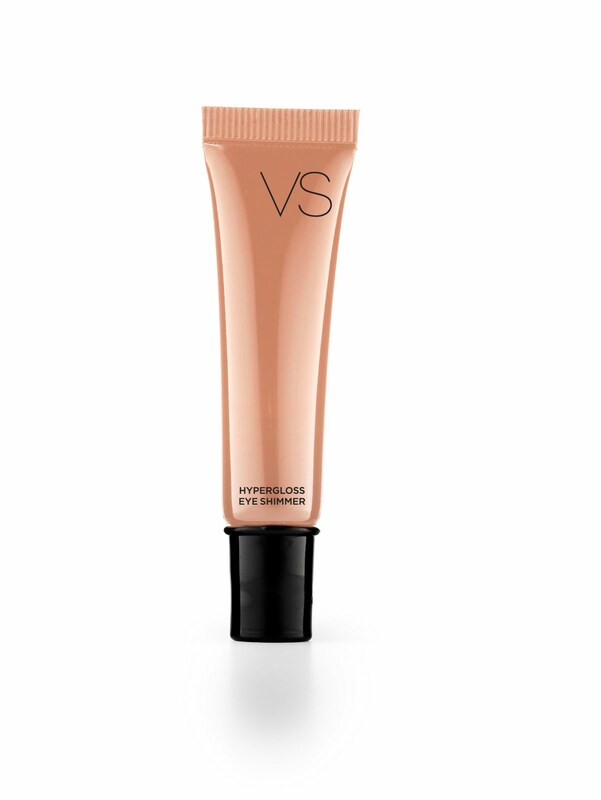 It contains poppy seeds to gently exfoliate and pumpkin seed oil to nourish the skin. Annatto seed oil and sage oil have anti-inflammatory and astringent properties, and cedar oil combats acne and oily skin. Visit www.wholetruthsolutions.com. 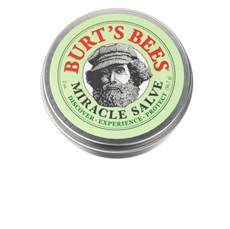 Burt’s Bees Miracle Salve ($7, 2 oz) contains pumpkin seed oil combined with protein-rich bee pollen olive oil and wheat germ extract to hydrate and protect dry hair and skin. Beeswax helps to hold in moisture. Visit www.burtsbees.com for store locations. The first time I used my Sound Oasis Sleep Therapy Pillow, I was testing it out in order to write a product review. I listened to Stevie Wonder and ended up listening to my entire collection of Motown anthologies. I didn't get much sleep that night, but I felt cozy under a warm comforter, my head pressed against the pillow as my favorite music flowed from inside. Then one night during a particularly hectic week when a deadline for six stories loomed just a few days ahead, I was tossin' and turnin', as the old Bobby Lewis song goes, and adjusting pillows, when I noticed a cord sticking out from inside one of them. I couldn't believe it. That pillow had been resting against the headboard as mere decor for more than a year, handled only to remove for laundering, the satin pillow case that protected it. I shook my head and connected the pillow to a portable CD player beside the bed, and this time I popped in a soothing CD from the Aquae Sulis Spa (JW Marriott, Las Vegas) and before it reached track number 10, fittingly called "Stolen Slumber," I was in slumber land. Music can be a great tool for relaxation therapy and has been proven to help reduce stress, ease depression and, as I can attest to, help relieve sleeplessness. It also helps if you chose the right music. The Sound Oasis Sleep Therapy Pillow is available in a standard size (20" x 26") polyester fill pillow that comes with two thin stereo speakers that fit inside, making it much more comfortable than using headphones. The 1/8" (3.5mm) plug fits most electronic devices, so you can use it with your iPod/MP3 player, CD player, TV or radio. The pillow is also hand and machine washable (the speakers can be removed). 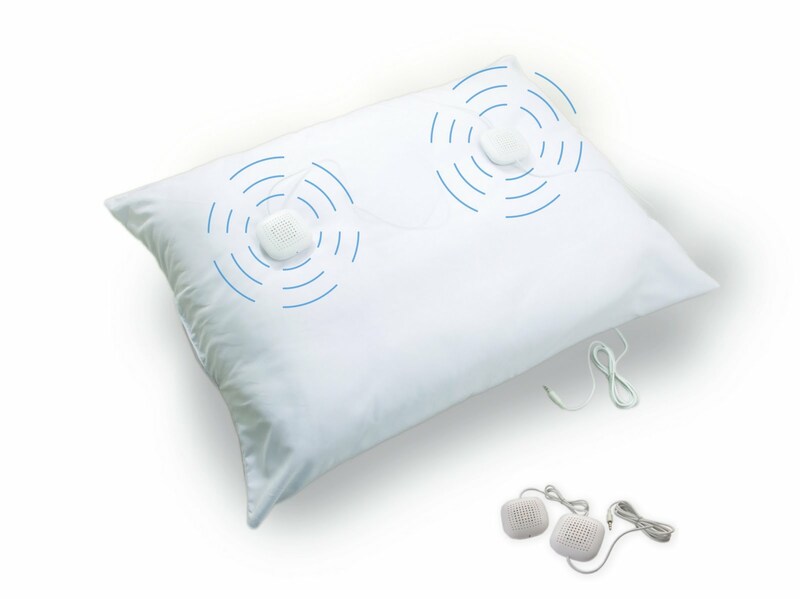 The Sound Oasis Sleep Therapy Pillow retails for $49.99 online at sound-oasis.com or by calling 1-866-625-3218. I read a brief item in the Writing World newsletter about a new Federal Trade Commission (FTC) ruling in relation to blogging. It reported that the FTC guidelines state that "any blogger in the States, who receives a freebie, including books to review in their blogs must now disclose them or face a fine of $11,000. " The item went on to say that the FTC guidelines suggest that bloggers who receive products for review are in effect receiving "payment in kind" and "can be seen as giving endorsements in return for the freebie." Payment? What is that? (More on this later). I had been talking to a couple of writers with beauty blogs about this very issue the night before. They objected to this scrutiny by citing the print publication editors and writers who receive product samples and whose professionalism and acceptance of these items has not come into question. The FTC believes that consumers would be aware that traditional media receive review products for free but that they might not be aware that blogs or at least less-established blogs, might be receiving free product samples. In reading the actual FTC document, however, the rules apply to advertisers and marketers that use blogs and social media for product endorsements, and to sponsored blogs and bloggers who are paid for endorsements or are given free products in exchange for endorsements. It does not seem to apply to media professionals such as well-established blogs from online and print publications, but how these rules apply to freelance writers with blogs is confusing. And how the FTC will determine which blogs are legitimate media outlets and which are amateur blogs or sponsored blogs, is another matter of concern. The FTC rules were met with quite a few irate posts, but I understand why the Commission, whose job is to protect consumers from fraud, would be concerned. I have visited numerous blogs by people who couldn't write a grocery list, passing themselves off as writers. Face it. Some bloggers really are writing product reviews simply to get free stuff. But for journalists, these items are neither payment nor gifts. For years film critics have been invited to free movie screenings, and are sometimes even flown to film junkets held in states other than their own. Book reviewers have been sent review copies and galley proofs. Music critics have received complimentary concert tickets and music. Need I mention restaurant critics and the network foodies who are presented with samples of cuisine that I’ve watched news anchors taste on air? This is a job. Do business employees pay for the supplies they receive in order to do their jobs? It is far easier for someone-- anyone--to put up a blog than to write for print publications where one must pass the scrutiny of editors, most of whom will check to make sure the writer has credentials and, well, gee whiz--can actually write. Professional writers and journalists have studied those minor details of composition--grammar, spelling, how to construct a sentence, etc., and have developed fact-checking and proofreading skills. Oh, and some have actually studied or at least have a sense of ethics, concerning issues of plagiarism and copyright infringement, for example. I think most consumers are smarter than the FTC (and apparently some magazine and newspaper bigwigs) think. I also think they know a legitimate journalist from a hack. And if they knew what most journalists and freelance writers make, I don't think they would mind them testing, and then keeping, that free tube of toothpaste they received in the mail--and really, do you think it would be wise for them to return it? I have been writing professionally for 32 years now. I have been a book reviewer, record reviewer, beauty columnist, new products columnist, and travel writer and my judgement has never come into question. I truly resent the fact that anyone can question my honesty or believe that my reviews and articles can be tainted because of a freebie. If a book, album or product, was, in my opinion, horrible, it didn't receive any ink at all. If it had flaws, those flaws were mentioned, and if it was great, naturally I'd let you know that too. Since I don’t let freebies influence my reviews (and believe me, I’ve been kicked off a few PR lists in the past because of this) I don’t mind adding a disclosure. However, if this fine applies to journalists, it is just another insult professional writers have had to endure since the dawn of the Internet. Where else can experts find a site where they can purchase books that they can pass off as their own to unsuspecting consumers? These are not books that are ghost written using these experts' knowledge and ideas. No, this is the publishing equivalent of a hair weave. The only thing that is real is your name and the fact that you bought the service. And where else can thieves take content (what we used to call articles) and simply change the by-line? A few years ago I did online research for a relationship article and came across twenty copies of the exact same article with twenty different by-lines! The culprits stole a list of five relationship tips from the advertisement page of the real author's website. The relationship tips had been offered free of charge to potential readers to entice them to purchase the book from which these tips were excerpted. Surely he did not intend for others to steal his work. I could go on and on and on with examples like this much like the search engine pages I had to surf through, but I won't. Well, actually I will mention two of the by-line boosters: one was a journalist from a Nigerian newspaper, the other as it turned out, was a psychic. Imagine the snickers I would have received if I had credited Madam I-Can-See-A-Man-In-Your-Future as an expert in my article. Several writers now Google their own names on a regular basis and find their hijacked articles on countless websites. Online publications that want four or more, well-researched, fully documented 1,000 word articles for the paltry fee of $25 (demanding All Rights, no less). So what does that amount to? About a half cent an hour, maybe? Get real. Upstart or simply cheap online and print publishers who think they are doing us a favor by allowing us to write for free in order to get a coveted by-line. Darling, I've been writing for years. I have more by-lines than I can count (many with more incorrect spellings of my name than you can imagine). I don't need a by-line. I need to pay the rent. Haughty publications that pay crap, yet enforce their archaic rules upon freelancers that extend even to work that doesn't have a damned thing to do with the publication. Websites and online publications that reprint articles without the writer's permission. No, reprinting an article simply by naming the publication in which it appears and crediting the author does not constitute permission. You have to contact the writer and set up an agreement for usage and/or payment. Content thieves that boldly steal articles and replace the true author’s by-line or tag line with their name. Plagiarists who make minor changes to articles and pass them off as their own. Any publication, online or print, that refuses to compensate writers for their work, whether it is by verbal or written agreement. This especially applies to publishers who not only refuse to pay for articles that have been used, but reuse the articles in additional publications and on their websites. That's it for my bitching and moaning. I'm going to take a Prilosec for the acid that is churning in my stomach over this. By the way, it is a prescription. The company didn't send it to me for free. 'Kay? FTC news release. You will also find links to information about the endorsement guidelines, as well as the text of the Revised Endorsement and Testimonial Guides at this site. I'd like to hear your thoughts on these issues. Please leave a comment. CEO Dan Hanrahan reveals the new Celebrity Cruise platform. 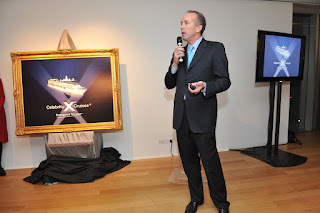 Celebrity Cruises celebrates its 20th Anniversary this year. The cruise line also opened 2010 with a new slogan, Designed for You, which was revealed at a function fittingly held at the Museum of Arts & Design. "What better time than our 20th anniversary to celebrate Celebrity’s history of award-winning services, cuisine and our new brand-defining Solstice Class?" 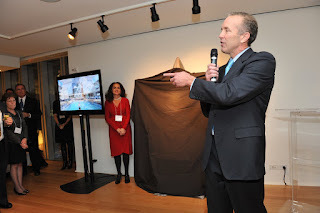 said Celebrity’s President and CEO Dan Hanrahan. "Everything we’ve offered over the course of 20 years and everything we’ll offer in the future, is designed for discerning cruisers." These offerings include new Celebrity Life on board experiences, the world-class cuisine of Chef Jacques Van Staden and an enhanced Captain’s Club loyalty program. "So we’ve summed up our long-time commitment to understanding them and delivering what they want," he continued, "within a new brand platform, Designed for You." The new and enhanced ship designs, services, cuisine and programs stem from the culmination of an extensive six-month exploration process that included a market research survey of nearly 10,000 international cruisers and focus group sessions with past guests and travel partners. The impressive Solstice Class fleet, for example, which features the Lawn Club, where passengers can enjoy outdoor activities on a manicured lawn on the top deck; the Hot Glass Show presented by the Corning Museum of Glass; Aqua Class, staterooms that share the same deck as the Aqua Spa and incorporate spa elements into the cabin design, as well as assigned seating in the healthy, specialty restaurant, Blu; and the industry’s first application of solar technology; has newly designed staterooms influenced by a panel of women with "unique travel and hospitality insights." The Millennium Class of ships will also receive Solstice Class features. The first to get the new enhancements is Celebrity Constellation. These enhancements range from new programs to restyled staterooms. For example, in the culinary area, there will be the addition of the Italian steakhouse Tuscan Grille, the popular creperie Bistro On Five and a wine bar with a serving system that allows guests to select and serve their choice of wine at the touch of a button. 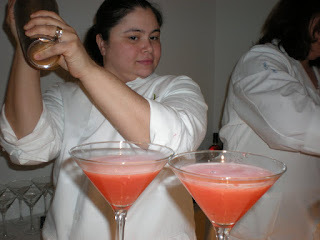 Celebrity's "Liquid Chef" serves up colorful and tasty cocktails enjoyed on Solstice Class ships. Hawaiian Lava, Berry Patch and Ginger Mojito. The fourth ship in the five-ship Solstice Class fleet will be Silhouette, which like its sister ships, accommodates 2,850 passengers, and features larger staterooms (90% outside and 85% with verandas), spacious bathrooms, several categories of accommodations including Celebrity’s Concierge Class and spa-inspired Aqua Class staterooms. For more information visit CelebrityCruises.com. Guests were greeted with champagne and chocolate cigars. 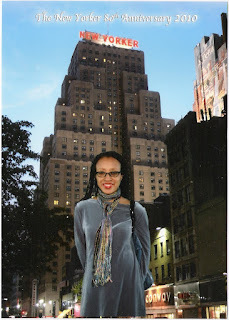 In all the years I've lived in New York City, I had never been inside the New Yorker Hotel. I didn't think about this until I walked into the beautifully refurbished lobby to attend the hotel's 80th Birthday bash. Many a celebration has been held here from weddings to bas/ bar mitzvahs, and on this day the hotel celebrated its 80th birthday while showing off a $70 million dollar facelift, (with a little botox and a tummy tuck thrown in for good measure) restoring it to its youthful 30's splendor--well, almost. With age you have to tweak your look a bit, to fit in with modern times. As it turns out, The New Yorker Hotel is more than just the landmark that let me know I was heading in the right direction for the bus to the nearby Javits Convention Center. Erected in 1929 at a staggering cost of $20 million, the New Yorker Hotel opened its doors on January 2, 1930. It was designed in the Art Deco style that was popular in the 1920s and 1930s, a style also found in the construction of the Empire State Building and Chrysler Building. For many years it was New York's largest hotel with 2,500 rooms, two ballrooms, ten private dining "salons" and five restaurants employing 35 master chefs. The barber shop was one of the largest in the world with 42 chairs and twenty manicurists. There were 52 telephone operators, and 150 laundry staff washing 350,000 items per day, all supported by America's largest private power plant which was installed in the New Yorker's sub-basements. 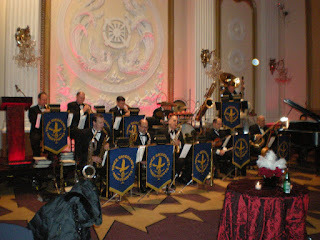 During its heyday in the 40s and 50s, Benny Goodman, Woody Herman and Tommy and Jimmy Dorsey filled its ballrooms with the Big Band sound. 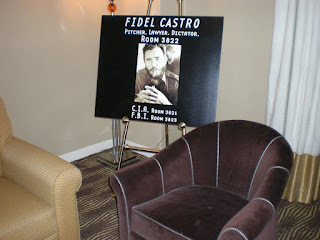 Famous guests and tenants included John F. Kennedy (as senator during his run for the presidency), actors Joan Crawford and Spencer Tracy, Heavyweight champ Muhammad Ali and Cuban leader Fidel Castro. The Brooklyn Dodgers were headquartered at the New Yorker for the 1941 World Series and Yankee Joe DiMaggio lived there while rehabilitating an injury during the baseball season. Just like the New Yorker, a mix of the old with the new. Check out those platform shoes! Business began to decline in the 50s and 60s and the hotel closed its doors in 1972. In 1975 it was purchased by the Holy Spirit Association (also known as theUnification Church headed by Sun Myung Moon), which used it primarily as Moon's residence and for church business. In 1994 the Holy Spirit Association formed the New Yorker Hotel Management Company and the building was officially reopened on June 1, 1994 as a hotel, with 178 rooms available to the public. Renovations continued over the next five years increasing the total rooms to 860. Since 2000 The New Yorker Hotel has been part of the Ramada Worldwide franchise (officially named The New Yorker Hotel, a Ramada Inn & Plaza). A $70 million renovation project began in 2007 to restore its Art Deco reputation and to add a modern edge and style. The renovation was completed in 2008. Guests were given the opportunity to pose in front of modern color backdrops or nostalgic black and white for commemorative photos. Why do I want to sing "Ebony and Ivory" all of a sudden? 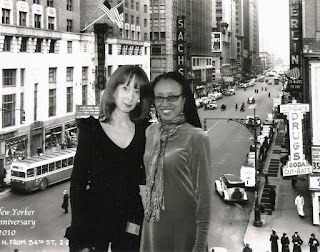 Friends beauty editor Candice Sabatini and SR's Gerrie Summers in classic black and white. The New Yorker Hotel now features 912 guest rooms and suites on the top 21 floors that have been restyled and renovated. (The first 18 floors are for commercial tenants and university housing. There are separate elevators for guest floors.) There are 12 meeting and conference rooms, a Fitness Center, Business Center, catering department, and refurbished restaurants, Cooper's Tavern and the 24-hour Tick Tock Diner. New Yorker Hotel, 481 Eighth Avenue, New York, NY 10001. 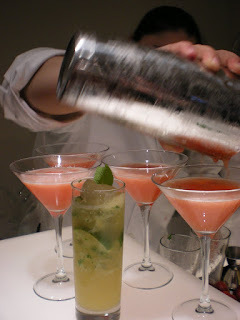 For more information visit www.nyhotel.com. 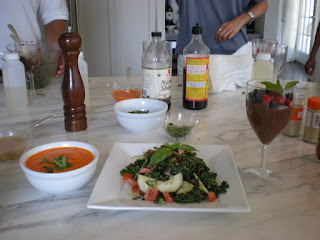 The day was approaching when I would begin the BluePrintCleanse and prepare for my upcoming colonoscopy. 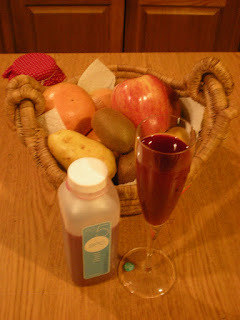 I had already been nervous about experiencing a full day of a liquid diet as per doctor’s orders. On a normal day, if I go too long without food, I might get wobbly legs and feel faint. So I decided to make it easier on myself by slowly eliminating coffee, meat and dairy. I don’t eat a lot of meat anyway, so that wasn’t a problem. I started eating more fruits and vegetables and less cooked and processed foods until the day before the fast, when I only had raw fruits and vegetables, water and tea. I was also sent three emails. The first came before the shipment, with information on the upcoming delivery and instructions on how to prepare for the cleanse for a "smoother transition." Tips included phasing out coffee, sugar, meat and dairy, and adding fresh fruits and vegetables to meals. "No farewell-to-solid-foods-with-a-steak-and-martini dinner the night before you start," the email warned. "You won’t be "a happy camper by the end of Day One." Storing up on food had crossed my mind because I thought I’d be faint by the time I needed to get to my doctor’s office. Another email came from BCP the day before the cleanse, with a sample prep menu and more instructions on how to begin the cleanse, such as starting off the first day by drinking hot water or hot water with lemon, to "wake up the system and get things moving." The Halflytely bowel prep kit that my doctor had me using to prepare for the colonoscopy took care of that, and I wasn’t "a happy camper." The juices are numbered and I was instructed to follow the order they had set up, for easy digestion and maximum absorption of nutrients. Just in case I "just had to chew something," they included a list of approved foods for cheating. BCP also shared suggestions for flushing the system: drinking water, green tea and herbal teas, and if you are having trouble, they suggest adding flaxseed oil to the juices or using herbal supplements. They had other tips to assist with getting the full benefits of detoxification, like having a massage to help the toxins move through and out of the body, exfoliating the skin to rid it of dead cells, and colonic hydrotherapy after the cleanse. I thought I would be a shaky mess after my doctor’s appointment on Day Two of the cleanse, but I only needed to munch on a couple of celery sticks on the way home, and frankly, I just think I talked myself into it because my body really wasn’t reacting to hunger. There were a couple of moments in the late afternoon and in the evening just prior to bedtime, however, when I really craved solid food, but it passed. The last day, Blueprint sent information on how to ease out of the cleanse by avoiding foods that are dense (which are the hardest to digest) and included a sample menu. I regret not following the cleanse to the letter ("The closer you stick to it, the better the results will be," they wrote). I went off the plan early because I had not factored in a party on New Year’s day, which happened to be the day after the cleanse was to end. I ate raw foods on Day Three, and then the following day I introduced a very small amount of cooked foods. If I hadn't had the party to attend, I’m sure I would have stuck to a mostly fruit and vegetable diet, and probably would have eliminated meat for quite some time. I hate to admit it, but even though I started off the day with a salad and avocado, I succumbed to the delicious meal my host had prepared. I guess I undid my cleanse with potato chips, shrimp with sauce, mac and cheese and Cornish hen. I know the Blueprint people would cringe. ("Listen to your body, it will tell you what it needs," the email advised. 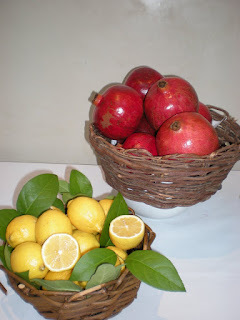 "Light fruits and vegetables? Great! Meat and potatoes? Well, now that’s just silly.") My body reacted slightly with a wave of nausea that passed quickly. But I knew better than to have seconds or dessert. Even though I somewhat botched my three-day cleanse, after going back to solid foods, I realized that my nose had started to run, I needed to use my asthma inhaler at one point, and I felt a bit sluggish, none of which occurred during the short detox. My skin also felt a lot softer and I didn’t need to lather on the lotion, since my body had been sufficiently hydrated from the inside by all the juice and water. Imagine how I would have felt if I had completely followed the Blueprint program. Two days later I was back to fruits and vegetables, juice and water, and I plan to buy a good juicer and make juice cleanses a part of my health regimen. You can bet that when I do a cleanse again, I will make sure there aren't any functions scheduled that will impede my goals. I'll also take BluePrint's suggestions and aid my body's detoxification with massage and exfoliation. I was much too concerned with the looming colonoscopy, to fully engage in the process. As for a colonic, well, that will never happen. It was bad enough doing an enema! BluePrint is a bit expensive ($65 per day) but the fresh juice is delivered to your door (it’s now also shipped outside of the New York area) and provides the nutrients you need. The company uses the Norwalk Press which they say is the most nutritionally complete method of juice extraction and extracts three to five times more vitamins, minerals and enzymes. Use of this method is also why the juice stays fresh longer and can be shipped to customers. I enjoyed the taste of most of the juices. Juice #5 (apple, carrot, beet, lemon, ginger) and #6 (filtered water, raw cashews, agave nectar, vanilla bean and cinnamon) took some getting used to, but I adapted pretty quickly. Juice cleansing is not a program to lose weight, although some people do lose weight during the process, but if that’s the sole reason you are doing it, you might be disappointed. The true benefits of fasting is to eliminate toxins from the body that come from certain foods (processed foods and non-organic produce that might be contaminated with chemicals) and from the environment. With juice fasting you get the nutrients the body needs, and the body utilizes the energy not being used in the digestion of solid food, to efficiently and quickly eliminate toxins. You should consult your doctor before doing a fast of any kind, especially if you are on medication or have other health issues. For example, this cleanse is not recommended if you are diabetic or on blood thinners. For more information email info@blueprintcleanse.com, call 212-414-5741, or visit the BluePrintCleanse website. Have you done a cleanse? If you've tried BluePrintCleanse or any other kind of fast or detox program, I'd love to hear about your experiences. 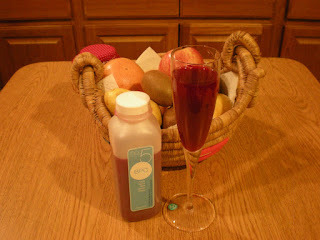 While most people toast in the New Year with champagne or some other festive alcoholic beverage, I welcomed 2010 with BluePrintCleanse juice #5, which is a mixture of apple, carrot, beet, lemon and ginger. Yumm-mmy. 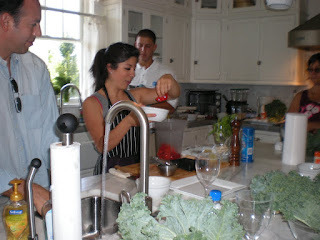 Back in August 2009, my friend Anne Raso told me about an invitation she had received to the media day of BluePrintCleanse Day Camp in Southampton. This day of wellness sponsored by the New York City-based juice company, would entail nutritional consulting, yoga, a natural food cooking class and spa treatments. That was certainly my cup of herbal tea. Neither one of us was sure we could sacrifice an entire day to this, since we were both on deadline for the same magazine, and I wasn't sure if I'd be munching on carrot sticks while drinking green juice, then pass out from hunger at the end of the day. But on that Friday, we boarded a special jitney en route to the Southampton Estate and I was glad we did. About three hours later, we had arrived. On one table inside the living room, were small bowls of raw, organic almonds. On another table was a pot of herbal tea, no coffee, which made me happy that I had raced off the bus just prior to departure, to buy a cup to satisfy my daily java fix. 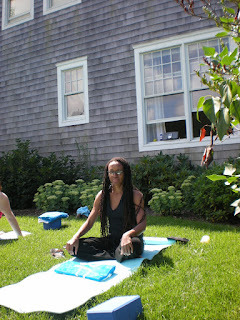 My first activity was a yoga class on the lawn under a clear blue sky and the warmth of the sun. Then while some guests were off having massages, facials or a scalp massage/shampoo and style, another group, which included me, joined the organic cooking class. I only had time to learn how to make the Marinated Kale Sesame Salad (which I would later make for family members to much fanfare) just before heading for my full-body massage. This was followed by a vegan lunch, then later I lounged by the pool, sipping organic wine and eating veggies dipped in edamame hummus, while waiting for my next appointment, an organic facial. My day at the Camp ended with a consultation with a nutritionist who told me a lot of stuff that I didn’t want to hear, but frankly already knew. Even though I have a pretty good idea of what I should and should not eat, I was embarrassed when I jotted down the meals I had the day before, which were nearly devoid of nutritional value. I've had better days. The nutritionist suggested that I drink 100% juice, eat organic eggs, and since I mentioned that I stopped being a vegetarian because I was losing weight and wanted, wait for it, to gain weight, she mentioned cheese (if organic and raw), turkey bacon that is nitrate-free (I had Butterball turkey bacon the day before–apparently not the best choice), raw nuts, raw nut butter, avocado, and organic cold pressed oil (olive or flax oil), all of which costs too much in NYC, but I guess if it will keep me out of the hospital and decrease the need for prescription drugs, it will be worth it. At the end of the day, we were given a gift certificate for a complimentary three-day BCP juice cleanse, which I put off until earlier this week because I thought it would make me too weak to function. I wound up scheduling the cleanse to coincide with a colonoscopy, which may or may not have been a good thing.